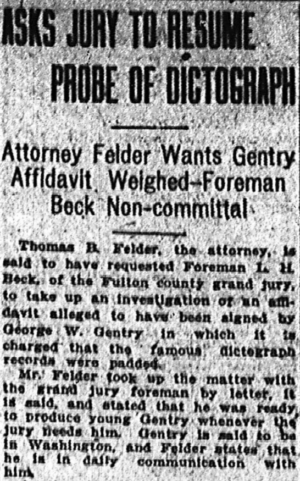 Thomas B. Felder, the attorney, is said to have requested Foreman L. H. Beck, of the Fulton county grand jury, to take up an investigation of an affidavit alleged to have been signed by George W. [sic] Gentry in which it is charged that the famous dictograph records were padded. Mr. Felder took up the matter with the grand jury foreman by letter, it is said, and stated that he was ready to produce young Gentry whenever the jury needs him. Gentry is said to be in Washington, and Felder states that he is in daily communication with him. Another figure in the dictograph episode who now is missing from the city is A. S. Colyar. At the Williams house, where he lived in the city, Colyar left no address, but reserved a room, saying that he expected to return to the city. Chief of Detectives Lanford declares that he does not know the whereabouts of either Colyar or Gentry, although he is conducting a vigorous search in Washington for the latter. Foreman L. H. Beck of the grand jury has stated again that the term of service of the present body is so short that it is absolutely necessary that it take up the routine business of the solicitor’s office. The foreman, however, will not make a definite statement relative to the dictograph probe or to the vice probe.